HARRISBURG, Pennsylvania -- Prosecutors moved to reinstate most of the dismissed charges Friday against 11 members of a now-closed Penn State fraternity for actions related to the death of a pledge earlier this year after a night of drinking and hazing. A judge in early September threw out the most serious charges against eight defendants, involuntary manslaughter and felony aggravated assault, but all 16 of those counts were refiled. As a result, those defendants again face the possibility of several years in prison, if convicted. There were no new charges against two who had waived the preliminary hearing, against four who faced single counts that were thrown out in September, or against one defendant who had 28 of 52 charges tossed and is accused of buying alcohol for the Beta Theta Pi bid acceptance night party. District Attorney Stacy Parks Miller had said after the seven-day, hotly contested preliminary hearing that she would re-file. "Continuing investigation is occurring around other outstanding matters and additional new charges may be forthcoming," Parks Miller, who leaves office in January, said in a statement. She also filed a request that a county judge appoint a new district judge for the second preliminary hearing. Attorney Rocco Cipparone, who represents defendant Michael Bonatucci, said he likely will contest Parks Miller's effort to reinstate the charges, as well as the request for a new judge in the case. "It's in my opinion unjust and unwarranted, both legally and factually," Cipparone said about the refiling. "There's nothing new. This is just the exact same charges that we litigated almost to the point where it felt like a trial, absent a jury." The charges relate to the Feb. 4 death of Tim Piazza, a 19-year-old sophomore engineering student from Lebanon, New Jersey. He was found to have a fractured skull, damaged spleen and other injuries and to have consumed a dangerous amount of alcohol after he died following participation in a Beta Theta Pi pledge ceremony. Recordings taken from the fraternity house's extensive system of security cameras captured many of the events that night, including Piazza's participation in a drinking "gauntlet" that required pledges to chug beer, wine and vodka. Not long afterward, Piazza needed to be helped to a couch, and his most serious injuries may have occurred during a subsequent fall down a long flight of basement stairs. The footage showed fraternity members taking ineffective and even counterproductive steps to help him, including pouring liquid on him and strapping on a loaded backpack to keep him from choking on his vomit. Piazza was shown stumbling around in the dark overnight, then disappeared from view. He was found the next morning unconscious in the basement, but it took his friends about 40 minutes to summon an ambulance. At the first preliminary hearing, defense attorneys argued their clients played minimal roles or did nothing that would constitute a crime. 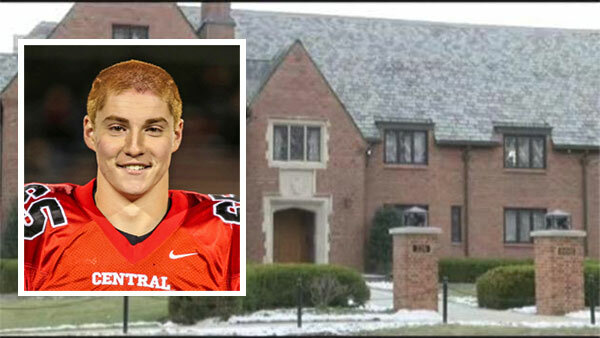 They argued the fraternity members didn't anticipate Piazza would be fatally injured. The Piazza family's civil lawyer, Tom Kline, hailed the district attorney's move to pursue the dismissed charges. "The Piazza family is both pleased and supportive of the refiling of the charges in their quest for complete justice in this tragedy," Kline said Friday. Lawyers for nine of the defendants did not immediately return messages. One declined comment. The remaining defendant, Craig Heimer, is accused of buying alcohol for the party. Prosecutors did not move to reinstate 14 counts each of reckless endangerment and hazing that were dismissed two months ago. He still faces 12 counts of furnishing alcohol to minors and 12 counts of alcohol violations. Heimer's lawyer, Evan Kelly, said he was "grateful" for the prosecution's decision. He said his client still disputes some of the remaining counts. "I think there are too many counts," Kelly said. "We dispute some of the other charges he's still facing. At the end of the day, he did commit furnishing." A court official said the defendants will be arraigned by appointment with the district judge.